New Titles and New Release Dates! This fierce cover got a lot of attention. The reviews were amazing. I AM JUSTICE was a Kindle Daily Deal, an Amazon Best Book of the Month, and a BookPage Top 15 Romance Books of 2018. So a lot of good things happened for the beginning of the series. Now Sourcebooks wants to expand on that good. Although my cover was everything I could want, it sent different signals to different readers. Some readers picked it up expecting an urban fantasy and others passed it by not knowing it was romantic suspense. This kind of confusion is something to avoid for books two and three. A series this bada** needs to find readers who will enjoy and savor every hot moment. That’s why Sourcebooks and the wonderful and creative marketing team at SourcebooksCasa is retiring Band of Sisters for a new, snazzier title. Keeping secrets is her job. Uncovering the truth is his. But his dogged quest for answers might just get her killed. Adopted into a fierce sisterhood of vigilantes, Gracie Parish has seen her most precious relationship destroyed by the truth. Forced to give up her son to keep him safe, she learned the hard way to protect her family’s secrets and her heart. Special Agent Leif “Dusty” McAllister will do anything to expose the Parish family’s covert operations. Gracie is his ticket in. He’ll use everything he’s got — fair, unfair, or just plain wrong –to uncover the truth. But the more he gets to know Gracie, the harder he starts to fall. As the smoldering attraction between Dusty and Gracie heats up, his investigation ignites a deadly threat from her past and reveals the haunting reason someone wants her dead. With danger closing in, Dusty must choose between his job or helping Gracie. While Gracie must decide if she trusts Dusty enough to let him help. Because now it’s not just her vigilante lifestyle in jeopardy, it’s her life. And that of her son. If you’d like to read the first four chapters of THE PRICE OF GRACE go to the bottom of this page and hit download. I’m so excited to share Gracie and Dusty’s incredible story with you!! This book will be available for purchase in Sep 2019, but I’ll be giving away some advanced reader copies (ARCs) over the summer for review! The third book in the BOC series, I AM HONOR now titled THE COST OF HONOR is out in Nov, 2019. This story is a bit of a spoiler for books one and two, so I’m hesitating to share more. Still, PW already gave it away with their spoiler-review of THE PRICE OF GRACE, so I’ll probably post a few chapters in the coming weeks. If it seems like a long wait to get more of the Parish family, don’t lose heart! Early next year, I’m releasing a novella featuring Dada Parish. 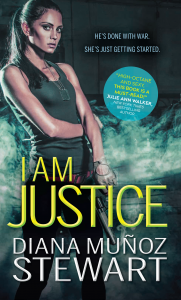 It details her harrowing antics in Mexico, before the events of I AM JUSTICE. I’m writing it now, and it’s an incredible romance. Plus gripping and suspenseful. Can’t wait for everyone to fall in love with her and ‘Juan.’ In addition to this novella, I’ll also be sharing more information about the Parish family–like this article–and a small history of the matriarch of the family, Mukta Parish. I’m also working on a new series. I’ll have details soon! Now you know all of the good news, so go out and spread the word!! Disappointed at having to wait until next year to read Book 2 in the series but excited to hear it is happening! Good Reads just said it was cancelled by the publisher. Ah, I feel bad about that! But I can tell you that they are worth the wait. Love these books so very much!! If you sign up for my newsletter, you’ll get a reminder when they’re released. Thanks for stopping by! And for your patience!